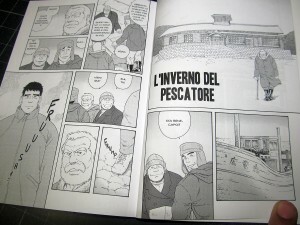 New Italian comic book, L’inverno del pescatore, is now published from Ren Books! L’inverno del pescatore (冬の番屋 Fuyu no Ban-ya / Winter Fisherman’s Lodge). Contact with the publisher directory. More about Gengoroh Tagame’s new Italian-language book, L’inverno del pescatore (冬の番屋 / Winter Fisherman’s Lodge), available now from Renbooks!